Graffiti has always been an urban expressionist art form. Oft times, both an expression of the human creative spirit and an outlet for emotion, graffiti have covered the walls of high rises in every city of the world. 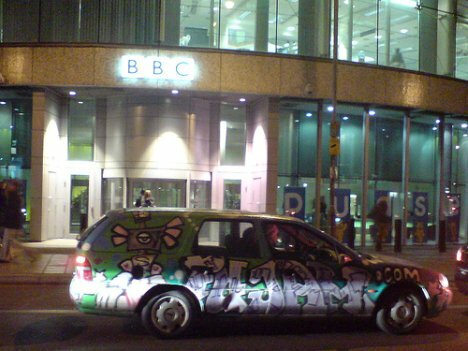 Is it any wonder that the art form soon moved to vehicles? 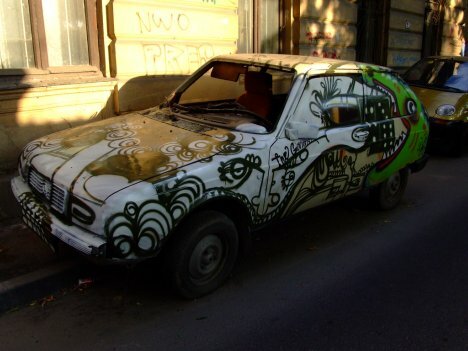 Here are the ten most unique and creative graffiti cars! 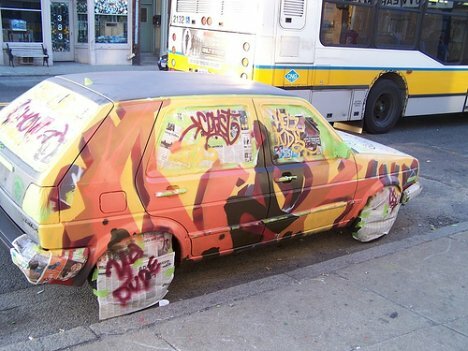 Apparently a work in progress when these pictures were taken, this Volkswagen Golf is getting a new urban paint job. Newspaper around the tires and windows protect everything but the body from getting painted. 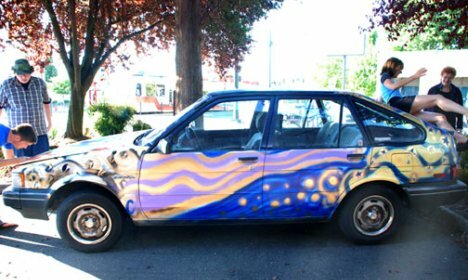 This artist decided to go with flat and bright yellows and oranges to give the car a fiery appearance. The lettering on the side almost gives the appearance of flames, which look very cool at a distance. 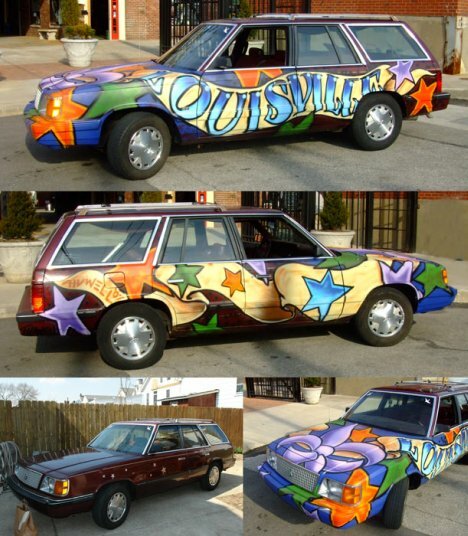 This station wagon went from average to awesome when it got it’s Louisville graffiti paint job. Vibrant blues and oranges are soothed by cooling purples and greens. Colorful stars dance down either side of the station wagon, as a light brown banner wraps around the car boasting pride for the owner’s city. This is certainly one great way to male an otherwise average car stand out in a crowd! 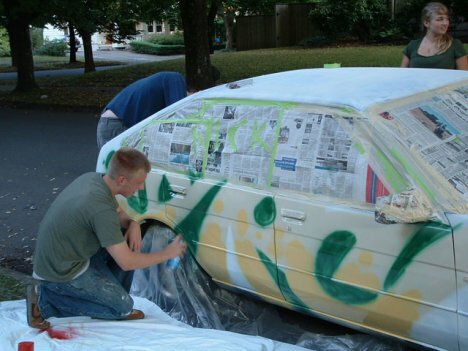 This car’s progression unfolds right before our eyes as it undergoes graffiti artwork from a couple of young artists. Photographed at different points throughout its creation, we gain a real sense of how the artwork came together. The driver’s side door appears almost as water with a purple and orange sky above. 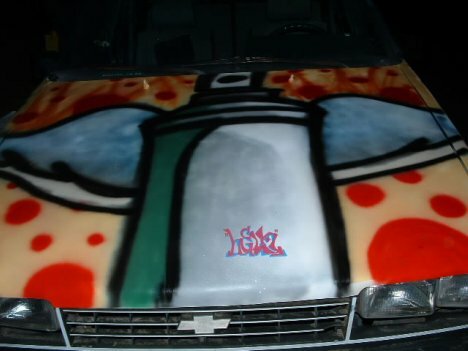 The hood art pays tribute the graffiti artist’s best friend, the spray-can. 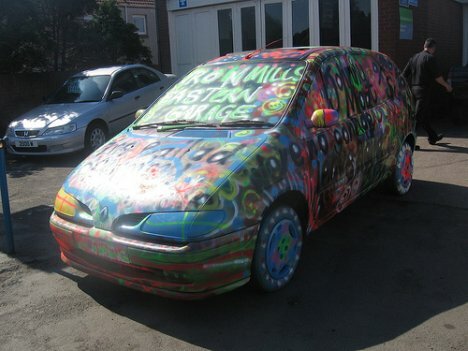 This car appears to have been graffitied up along with the rest of this shop. The shop looks to have been abandoned and cleaned out, except for that singular car that remains behind. 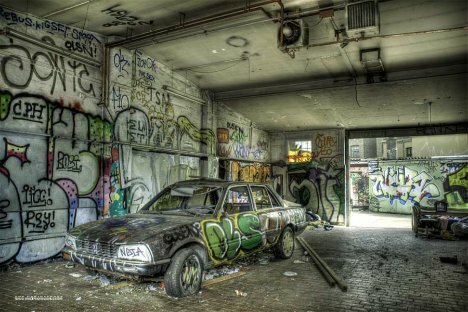 This huge abandoned room is a perfect target for graffiti artists, and the car simply adds another element to the art. 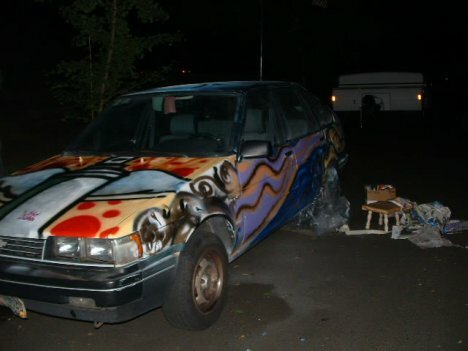 This car is done in an artistically interestingly way. Beginning in black and white from the hood and flowing to full vibrant color toward the back, this work offers much to look a and take in. Interesting too, is the fact that the back window is a totally separate piece from the rest of the car. The entire rear end is a giant one eyed monster that stares at all cars who travel close behind. 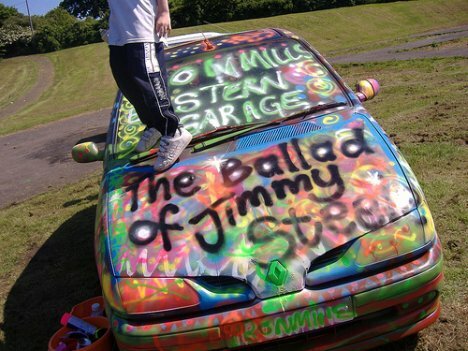 The artist, apparently by the name of Jimmy Steel, chose to spray up this van in a myriad of loud, bright colors. Possibly an advertisement for “Ron Mill’s Eastern Garage,” the car is covered roof to tire in paint, and no space is spared. 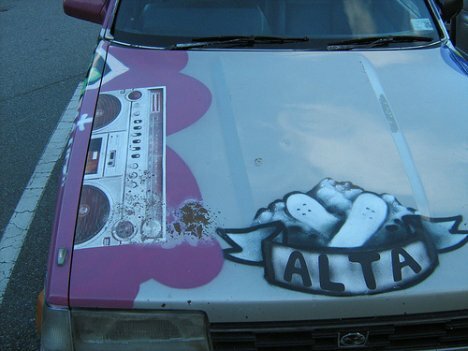 This is certainly not the car you want to pick up your Saturday night date in! At first glance the van is almost difficult to see! Graffitied as a natural extension of the graffiti work on the wall behind it, this van blends in quite well with its enviornment! 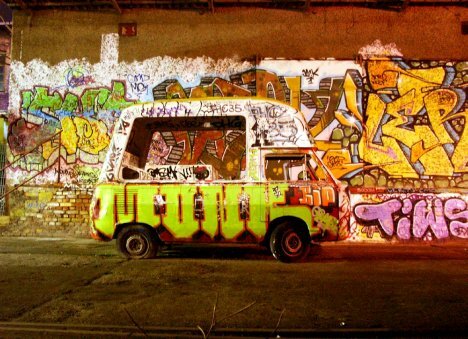 One can imagine the van being abandoned in front of such an excellent graffiti wall. No true artist would allow that to stand in the way of his art! The solution, work it into the mural. 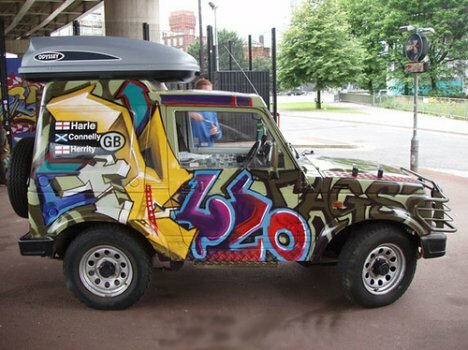 Urban art goes offroad with this graffitied-up jeep! 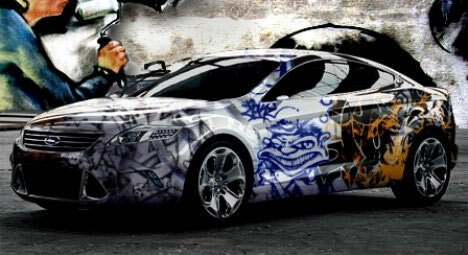 Sporting the 420 numbers on the side, you can guess as to the inspiration for this piece of art! 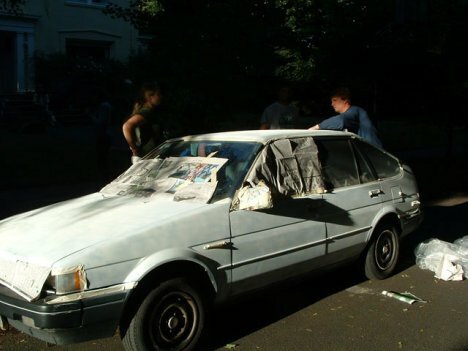 The only concern here is that the rear windows are all painted over! Seems like somewhat of a driving hazard, but saftey always looses to expression, and this jeep is no exception. 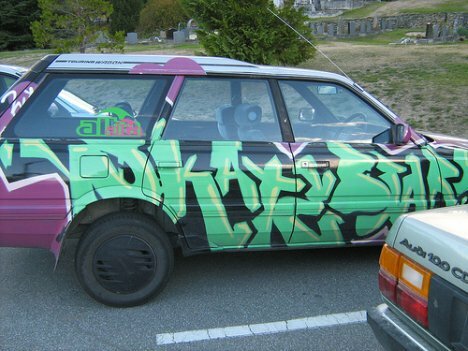 Done up in green, black and purple paints, this Subaru wagon no longer looks like every other mid 90’s car on the road! The driver fancies himself a “Skate Star” and apparently wants the world to know it! 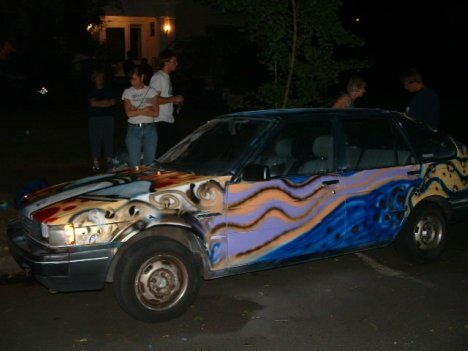 Believe it or not, this car is actually a moving adverstisement. Guerrilla Marketing at its finist, the driver appears to be the owner of the URL painted onto the side of his wagon. Driving around in a mobile billboard is a good way to expand your user base, especially in a busy city!